NOTE: This is NOT an official Holochain Website. It is run by the community. Holo is about the empowerment of a global community of citizens. Users have ownership of their own data, and can choose whom they share that data with. Being agent-centric, interactions are viewed from the user’s own perspective. Holochain is much better than blockchain at anything that requires less than universal consensus (most things): It’s faster, more efficient, more scalable, adaptable, and extendable. Holo itself, is a Holochain distributed app, that provides an ability to interact with Holochain apps through a Web Browser. Holo Fuel is a mutual credit cryptocurrency that can be used to buy hosting on the Holo network. 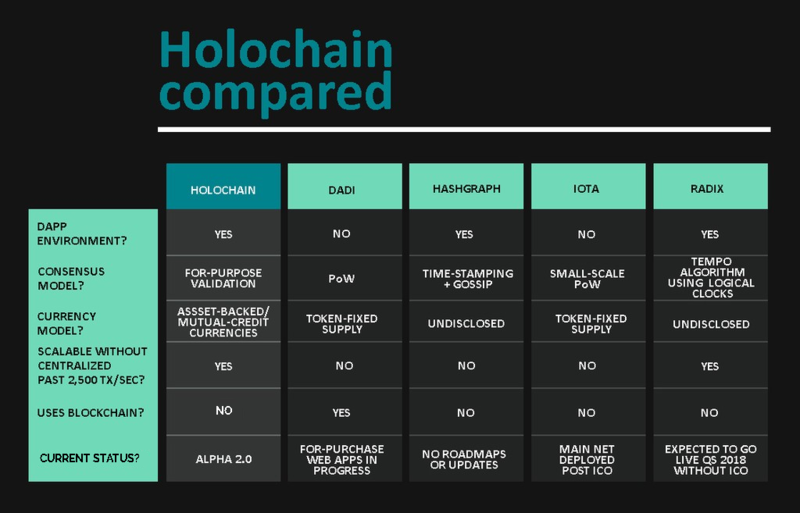 Holochain is an alternative to blockchain, which is faster and more scalable, designed for running distributed applications. Holochain is faster. Holochain Apps don’t require syncing or intimate knowledge of every change that takes place, making them much faster than blockchain apps. Holochain is more efficient. Not needing to have everyone make a copy of every change makes Holochain exponentially more efficient and affordable. This means Holochain can be used for things that blockchain is not feasible for, such as accounting for microtransactions. Holochain is scalable: Thanks to its parallel architecture, Holochain can support applications with billions of simultaneous users. Holochain is adaptable: Users can adapt apps and protocols to meet their needs. Holochain is extendable: Users can extend applications by linking them to other applications. Anything a user can read out of one app, they can write into another. Never before has such a fast, efficient, scalable, adaptable and extendable Data Integrity Engine for Distributed Apps been made available. Holo acts as an unifying interface for Holochain Distributed Apps. Anyone with a Web Browser will be able to access and interact with other users without having to install Holochain on their own machine. Holo is itself a Holochain Distributed App, but one that provides a bridge between the world of Internet users and the Holochain Ecosystem. Mutual Credit involves two people or entities transacting with each other, recording a Debit to the Spending account and an equal Credit to the Receiving account. The following index of articles is recommended reading to quickly understand the need for Holochain, Holo and Holo Fuel. 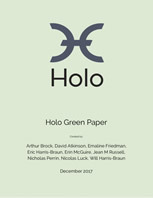 The Holo Green Paper features the 5 Major Novel Innovations that Holo will bring to Market. Holo​ is a bridge to link the advanced crypto technology, ​Holochain, and everyday users. 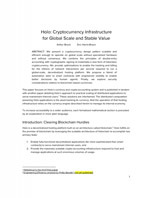 This document explains how ​Holo​ works and the business model and funding that support it. ​Holochain delivers on the dreams of making ​decentralized computing​ easy and real. It provides the underlying cryptographic fabric to maintain data integrity across unlimited peers without requiring consensus. no bottlenecks nor global delays. In fact, ​Holochain is so efficient that you can run over 50 full ​nodes​ on a cell phone or a $35 Raspberry Pi computer. ​Holochain even enables scalable ​crypto-accounting​ to build new generations of asset-backed and value-stable cryptocurrencies. The Holochain White Paper describes a scalable, adaptable, user focused, distributed platform. The Holochain White Paper is a detailed formal verification of the Holochain system, along with its ability to adapt to the vast majority of use cases, and improve over time. The paper is written with the history of decentralized systems in mind, but comes from the perspective of building a system with benefits to the end user. Considerations are given to issues of scalability on a global magnitude, and total complexity of the system. Perhaps most importantly, the paper discusses the ability of Holochains to maintain the correctness of the data across virtually unlimited peers without requiring consensus. The Holo Currency Paper presents a Cryptocurrency of Global Magnitude. Is it really possible to design a Cryptocurrency usable on a Global scale that retains its value the next day? Is it possible to do this without consensus or expensive hardware? The Answer to both these crucial questions is “YES” according to Arthur Brock and Eric Harris-Braun, currency, computing and cryptographic experts. Can a system like this be truly secure? Find out in this exciting new Cryptocurrency paper, which will have positive consequences for the vast majority of humanity. Why do you call it “Holochain”? What is Holochain’s consensus algorithm? Who is on the development team? What is their history and experience? What is the TPS on Holochain? Recently, some critical comments were made by a person concerning Holochain, Holo and Holo Fuel. This is the response to those comments. The critic’s original comments are in dark purple. Hosting includes usage of RAM, storage, retrieval, CPU cycles and bandwidth. What is the point of a widget for renting out servers? Holo is a Holochain distributed app that facilitates the easy access of other Holochain dApps while paying hosts in Holo Fuel. Imagine if renting a VPS was as complicated as what holochain is suggesting. It would be absurd. Holochain is complex, not complicated. It is a feat of software architecture engineering, which retains a high degree of cleverness, while promoting simplified accessibility and extensibility for developers. Holo functions as a seamless bridge between the end user’s internet activity and a Holochain based dApp. Imagine if you rent out your computers, but then you get paid out in a currency that you cannot sell or get out of, except through a third party who controls how much of your money you can get out or spend (holo). Holo is a one of a kind system where the people contributing to the network stability, maintenance, validity, and availability can earn Holo Fuel for their service, and immediately cash out directly from the reserve account. In the crypto world, this is unique. Many ICOs and post launch cryptocurrency issuers will promote their own coin or token as something of value. The proof of the real value of a cryptocurrency is if the issuer finds value in their own cryptocurrency. Holo has confidence in the long-term value of their own cryptocurrency. c) Are willing to purchase it back at a price that is more than what they originally sold it for. Also, who is buying holofuel! That is not addressed in the white paper. dApp providers buy Holo Fuel from ICO contributors to pay for hosting. All of the apps on internet are free (facebook, twitter, google, are free. telegram is free). The Apps that make a product out of its own users are usually free. Useful Apps, on the other hand, like Shopify, AliExpress, Amazon, Uber, ActiveCampaign, AdWords, Facebook Ads, Lynda, etc. usually require payment. Are you going to make users buy holofuel to use apps? Users do not necessarily require need Holo fuel to use Apps, and in many cases, they can actually end up with a surplus of Holo Fuel if they host more than their own usage of the network. Are the app providers going to pay holofuel (lose money). The App providers may or may not have to pay Holo Fuel based on their revenue model, but many will. AliExpress vendors pay fees for usage of the AliExpress ecosystem, but they are quite happy to do so because the same ecosystem provider helps to save time and money, while rewarding innovation and trustworthiness. Everyone is receiving holofuel, but no one is buying the holofuel. Everyone in the Holo ecosystem is interested in acquiring Holo Fuel, including the issuing entity. DHT cannot be used in public network under adversarial conditions for payments channels. It has a non-zero percent failure rate consistently, meaning the state fails to sync. Period. Everyone knows that. Holochain does not use a DHT in isolation. 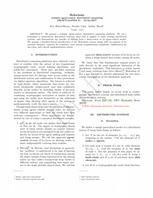 Holochain uses a DHT in conjunction with Notaries. This eliminates any chance of failure unless the whole network went offline at the same time. The holo community is cancer. Anyone is free to visit the core Holochain and Holo community at https://chat.holochain.net/ and see for himself or herself, the warmth, openness and cooperation that is obvious there. I have never had another coin’s social media management people come in and brigade the Skycoin chatroom, like they were a bunch of screaming pre-pub children. The social media management team of Holo never have and never will, act toward another community in a way that is unbecoming or ill mannered.